34 people are confirmed dead at the Resorts World Manila incident on Friday, June 2, 2017. 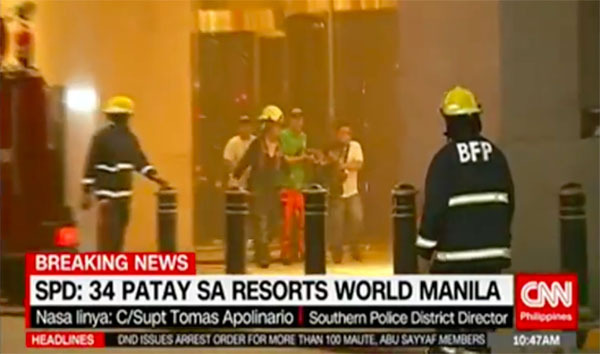 In an interview with CNN Philippines, Southern Police District Director Tomas Apolinario said that 34 dead bodies are found following the Resorts World Manila incident, Friday morning. Apolinario clarifies that cause of death is not from gunshot but due to suffocation. Initial reports said that 25 were killed. Meanwhile, Philippines National Police Chief Ronald Dela Rosa ruled out the involvement of ISIS group in the incident. “So far as we are concerned there was no ISIS,” said Dela Rosa. “If this is ISIS, all the people gambling inside should have been shot or already been bombed. He didn’t hurt anyone and went straight to the casino chips storage room. Those who were injured got their injuries when they jumped from the windows,” he added. The unidentified gunman burned himself to death in a Maxims Hotel room according to the police.